Primary Care Research Group, University of Exeter Medical School, Exeter. Background UK general practice is experiencing a workload crisis. Pharmacists are the third largest healthcare profession in the UK; however, their skills are a currently underutilised and potentially highly valuable resource for primary health care. This study forms part of the evaluation of an innovative training programme for pharmacists who are interested in extended roles in primary care, advocated by a UK collaborative ‘10-point GP workforce action plan’. Aim To explore pharmacists’ perceptions of primary care roles including the potential for greater integration of their profession into general practice. Design and setting A qualitative interview study in UK primary care carried out between October 2015 and July 2016. Method Pharmacists were purposively sampled by level of experience, geographical location, and type of workplace. Two confidential semi-structured telephone interviews were conducted — one before and one after the training programme. A constant comparative, inductive approach to thematic analysis was used. Results Sixteen participants were interviewed. The themes related to: initial expectations of the general practice role, varying by participants’ experience of primary care; the influence of the training course with respect to managing uncertainty, critical appraisal skills, and confidence for the role; and predictions for the future of this role. Conclusion There is enthusiasm and willingness among pharmacists for new, extended roles in primary care, which could effectively relieve GP workload pressures. A definition of the role, with examples of the knowledge, skills, and attributes required, should be made available to pharmacists, primary care teams, and the public. Training should include clinical skills teaching, set in context through exposure to general practice, and delivered motivationally by primary care practitioners. Pharmacists in general practice roles. 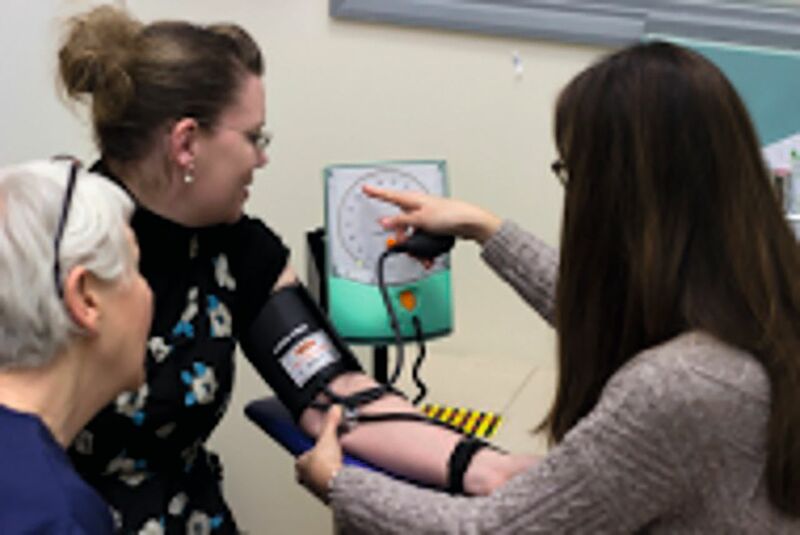 A training programme for pharmacists interested in extended roles in primary care was developed through an NHS Education South West-funded project carried out by the University of Exeter Medical School. It was delivered face to face and consisted of 6 full days completed over 6 consecutive months, with associated self-directed learning. A GP and a pharmacist were the main course facilitators, and practice nurses were also involved in delivery of course content. Taught elements encompassed practical clinical skills training alongside theoretical teaching on acute illness, long-term conditions and multimorbidity, evidence-based practice, pharmacology in primary care, the organisation, structure, and delivery of general practice, and the importance of patient experience. There was also an opportunity to attend a 1-day placement in general practice. Appendix 1 outlines the course programme. The training programme was evaluated through a mixed-methods approach using study day feedback, multiple-choice question assessment, and qualitative interviews with participants. Changes in the skill mix and delegation of duties between primary care practitioners has previously been seen in the UK, notably during the introduction of nurse practitioners.10 There have, however, been few studies that have specifically investigated the integration of pharmacists into general practice roles. This qualitative study aims to explore pharmacists’ perceptions of primary care roles, including the potential for greater integration of their profession into general practice and the future potential of this role. This study used qualitative methods to contribute to the currently sparse literature on pharmacists’ perceptions regarding the integration of their profession into UK general practice. The study shows that there is enthusiasm and willingness, especially among junior pharmacists, for new, extended roles based in primary care, which should be harnessed in order to relieve current GP workforce pressures. A definition of the role, with examples of the knowledge, skills, and attributes required, should be made available to pharmacists, primary care teams, and the public. Primary care training for pharmacists should include clinical skills teaching, set in context through exposure to general practice, and delivered motivationally by primary care practitioners. The study took place between October 2015 and July 2016. A database of pharmacy contacts in the South West (Devon, Cornwall, and Somerset) was created using local pharmaceutical committee and clinical commissioning group emailing lists, as well as social media, in order to inform pharmacists about the training programme. Written applications were used to collect information from interested pharmacists, including current role, qualifications, and future career plans. This enabled purposive sampling by level of experience, geographical location, and type of workplace. Three researchers independently scored the applications by level of motivation, experience, and career plans. There were 16 course places available. Those applicants with the highest scores were selected to attend the course and were invited to participate in two confidential telephone interviews, one before and one after the course. Written informed consent was obtained prior to undertaking interviews. A semi-structured interview guide was used (available from the authors on request) and interviews were digitally audio-recorded and transcribed verbatim. Interviews were listened to repeatedly in order to improve transcription validity. A constant comparative, inductive approach to thematic analysis was used.11,12 NVivo (version 11) was used to organise the data. New fragments of coding were constantly compared with old data in order to construct new common themes,12 and to make cautious propositional statements. No new themes emerged during analysis of the final transcripts, thus theoretical saturation was considered achieved. Of the 1050 pharmacists contacted by e-mail, 38 replied and 16 were purposively selected for the training programme. All 16 agreed to participate in interviews but one could not complete the post-course interview due to personal circumstances. Table 2 shows participants’ characteristics. Many participants had little or no prior experience of working in a general practice surgery. Pre-course and post-course interviews lasted 30 to 45 minutes. There were no significant problems with conducting interviews or with the quality of transcription data. The main themes that emerged from the data related to participants’ initial expectations of their role in UK general practice, the influence of the training course on their perceptions, and their predictions for the future of this role. Before the training programme, participants varied regarding what they defined the role of a pharmacist working in primary care to be. Definitions included: practice-based pharmacists conducting patient clinics and home visits; community pharmacists providing written advice to GPs; and clinical commissioning group-employed pharmacists running prescribing checks on practice databases. Many saw the role as a means to reduce GP workload and to enable more efficient and effective patient care. Many felt they were in the best position to address medication adherence, through applying their knowledge of packaging options or frequency of administration, to reduce polypharmacy to safer, more manageable numbers of prescribed medications per patient, and to monitor prescribed medications that could otherwise lead to adverse events. Some felt that pharmacist prescribers were more likely than other practitioner prescribers to meet government cost-effective prescribing agendas, by maintaining their knowledge of drug formularies and medicines availability. Most participants reported a limit to the level of their proposed responsibilities: being willing to take a proactive approach to medicines optimisation, using biochemistry results and therapeutic drug monitoring, but wanting to pass complex diagnostic decisions to a GP. Some discussed potential difficulties attaining clinical management decisions, however, particularly if addressing a whole team of GP partners during a clinical meeting. The importance of maintaining good working relationships and written communication skills was reflected upon. Participants varied in levels of expressed self-confidence for working in general practice. Greater confidence appeared to be associated with greater experience and qualification, and with a willingness to accept more responsibility in respect of patient care. Several participants’ perceptions of a pharmacist’s role in general practice were influenced by their participation in the training programme described previously. Many participants anticipated an increase in the numbers of pharmacists with independent prescribing skills. Others visualised practice pharmacists becoming gatekeepers: liaising with community pharmacists and addressing medication queries using their access to patient notes. Several speculated about allocating more time per patient encounter than is currently possible for a busy GP and managing their own appointments to ensure better continuity of care. However, those with experience of general practice acknowledged logistical factors that limited these ideal circumstances including shortages of clinic rooms and high levels of patient demand. A common perception was that the future of a pharmacist’s primary care role was to fulfil public health agendas, to ensure government standards regarding health checks, for example, and to reduce polypharmacy, particularly in respect of vulnerable groups such as older patients and those with multimorbidity. Many participants reported that they would value the opportunity for team working, reflecting on the relative isolation from clinical care experienced in community pharmacy. Some felt that working as the only pharmacist in a practice might bring a different type of isolation, however. Some wanted to become leaders in their field, to inspire others to join them in a general practice environment. The subject of salary was discussed. The pay ‘banding’ currently advertised in many primary care posts would mean a drop in salary for an experienced community pharmacist but was on par with hospital pharmacy. Pharmacists employed by the clinical commissioning group often had different job descriptions and salaries from those employed privately by GP practices. Pharmacists perceived ongoing differences in the ‘cost-effective versus clinically effective’ priority weightings of their workload by different employers. All participants agreed that a clear vision for the future was required nationally and that it needed to be communicated widely among their professional group. Participants’ perceptions varied by degree of experience of working in primary care, and by current working role. Therefore there was wide variability in their understanding of the role of the pharmacist in UK primary care and in the way that the training course influenced their perceptions. All participants recognised challenges and uncertainties regarding the future direction of the role, and their degree of experience, along with the training they received, influenced their confidence for this type of work. There were also several perspectives regarding the skills, knowledge, and attitudes required for a role in primary care, as well as the potential outcomes that might be achieved. However, all participants appeared willing to contribute to the relief of workload pressures on GPs and on the primary care team. The most recently qualified pharmacists, and those with less experience of working in primary care, appeared the most willing to engage with training and with career opportunities for extended roles in general practice. This study used qualitative methods to contribute to the currently sparse literature on pharmacists’ perceptions regarding the integration of their profession into general practice in the UK. The sample size for interviews was predetermined by the number of available places on the training course. However, the sample size is comparable to previous studies using similar methodologies,13 and was sufficient to have achieved saturation.14 There was heterogeneity by age, type of employment, and previous level of qualification. Participants had a high degree of interest in the subject area, which provided rich material for qualitative analysis. The schedule for development of the training programme, marketing, and commencement of the course was tight. With a longer recruitment period there may have been a greater uptake for the course. However, the authors believe that there were sufficient numbers and sufficient heterogeneity of participants, with high scores on their application forms, to fill the 16 available places at the time of commencement. It was apparent that participants had different perceptions regarding what constitutes ‘primary care’ during early interviews, and the interviewer subsequently sought to clarify the context with participants. Because of their workload, different researchers conducted the pre-course interviews and post-course interviews. Participants were not informed of this unless they asked and this occurred on one occasion at the end of the postcourse interview. Positional reflexivity was demonstrated through reflective notes and critical discussion between authors.16,17 A GP researcher was able to interpret interview content from a clinical perspective, which was useful during analysis. The participants expressed uncertainty regarding the definition of a pharmacist’s role in primary care. The UK literature is currently sparse because of the evolving nature of the role, therefore, with acknowledgement of the differences in pharmacists’ primary care roles internationally,9 comparisons were drawn with the international literature. In Canada, Jorgenson et al 18 used qualitative methods to identify that a pharmacist’s lack of clarity about, or knowledge of their primary care role, negatively affected their potential integration into the primary care team. They also highlighted that difficulties with patients’ access to the pharmacist, influenced by resources and funding, could also have a negative impact.18 The more experienced participants in the current study also reported the same difficulties. Several participants who had little or no experience in primary care were concerned about how they might be perceived in this new role by other members of the primary care team. Jorgenson et al18 identified that a pre-existing relationship between the pharmacist and the general practice in which they will work, and the primary care team’s perceptions of the pharmacist’s confidence, assertion, and visibility in the team, could have a positive influence on their successful integration. Conversely, perceived resistance by doctors to accept or to trust the pharmacist in their new role, and a lack of managerial support, had a negative impact. An Australian study additionally emphasised that having time to build trust in a pharmacist was of importance from the perspective of both practice staff and patients.19 The participants in the current study also felt that continuity with patients and maintaining frequent communication with other members of the primary care team were important. The Canadian IMPACT project20 emphasised the importance of pharmacists spending time in general practices during their training, particularly highlighting the relevance to the development of pharmacists’ identity in primary care settings. The UK’s Centre for Pharmacy Postgraduate Education has a ‘Declaration of Competence’ system developed to support pharmacists in assuring commissioners that they have the appropriate knowledge, skills, and behaviours to deliver high-quality, consistent services.21 Several core competencies for a pharmacist working in primary care have also been outlined by a Canadian Delphi study, relating to communication, collaboration, and professionalism, with an emphasis on direct patient care.22 The participants in this study discussed the skills, knowledge, and attitudes that they had gained from the course in respect of these competencies, as well as reflecting on the relevance of the training when undertaking patient care in a general practice surgery. Some of the participants, particularly those who were more experienced, or who were already working in primary care, felt that their role should focus on their expertise in medicines management and medicines optimisation. Consultations with a pharmacist regarding medications, in a general practice setting in the UK, have previously been reported to be rich in content, acceptable to patients, and perceived by pharmacists to be a possible way to extend their role.23 The first randomised controlled trial of pharmacist prescribing in the UK suggested that there may be a benefit for patients with chronic pain.24 A UK analysis of audio-recorded consultations about medications, between patients and pharmacists in general practice, concluded that pharmacists were patient centred, and responded positively and effectively to patients’ emotional cues and concerns.19 The participants in the current study recognised the importance of a holistic, individualised approach to patient care and they valued the communication skills training on this course. The participants were very aware of safe practice, and were seeking to ensure that they were working within the boundaries of their own clinical competence. They discussed the implications of extended roles on their indemnity cover as well as in the context of salary. The PINCER study,25 evaluating a pharmacist-led, information technology-based intervention, showed that this approach can reduce medication errors in general practice, when targeting patients on high-risk medications. Similarly, a cluster randomised trial of a pharmacist-led intervention for patients with established heart disease showed improved prescribing of statins and improvements in target cholesterol levels.26 Indemnity companies are working to finalise fees relating to the specific roles that a primary care pharmacist might undertake. GP practices vary in the salaries paid to current primary care pharmacists. From the findings of this study, the authors suggest that future training programmes should seek to target pharmacists who are soon to be commencing new roles in general practice surgeries. The use of experienced primary care pharmacists as course facilitators would be well received by trainees. Courses should include clinical skills training, including those skills applicable to the management of minor ailments and to chronic disease clinics; spending time shadowing and practising skills in a general practice environment; receiving teaching from other primary care practitioners; and a discussion of the attitudes and professional values required for the role. The course should be delivered with a motivational approach in order to positively influence pharmacists’ hopes and expectations for the future of the role, and should be set in context through the use of clinical case scenarios. Pharmacists should also be encouraged to complete a prescribing certificate. In addition, further research is needed to assess the impact on GP workload of effectively training pharmacists to work in primary care roles in general practices. Further qualitative work could usefully assess pharmacists’ experiences of commencing a new role in general practice, and compare the experiences of those who have or have not recently completed a primary care training programme such as this. The findings from this study have the potential to inform the successful integration of pharmacists into primary care roles, working in general practices in the UK, in order to help relieve the current workload pressures on GPs. Assoc. Professor Colin Greaves; Dr Chris Clark, GP; Dr Emma Parker, GP Registrar; Dr Rob Daniels, GP; University of Exeter Clinical Skills Resource Centre; Mrs Judith Magowan, Nurse Practitioner; University of Bath, Department of Pharmacy; Mark Stone; Jo Watson; Sally Mayell; Dr Bettina Kluettgens; David Bearman; Dr Jo Roberts; Dr Andrea Taylor; volunteer patients; Ide Lane Surgery; St Leonard’s Medical Practice; Okehampton Medical Practice; Rolle Medical Partnership; Chilcote Medical Practice; ISCA Medical Practice; Wonford Green Surgery; Devon Local Pharmaceutical Committee; Royal Pharmaceutical Society; Northern, Eastern & Western Devon, and South Devon & Torbay Clinical Commissioning Groups. COPD = chronic obstructive pulmonary disease. CVS = cardiovascular. ENT = ear, nose, and throat. Funding was provided by Health Education England (South West). This project has been reviewed and approved by the University of Exeter Medical School Research Ethics Committee (UEMS REC Reference Number: Jun16/B/089). Revision requested March 31, 2017. This is an OpenAccess article distributed under the terms of the Creative Commons Attribution License (http://creativecommons.org/licenses/by/4.0/), which permits unrestricted reuse, distribution, and reproduction in any medium, provided the original work is properly cited. (2016) Understanding quit decisions in primary care: a qualitative study of older GPs. BMJ Open 6:e010592. (2014) GMC sees 15% fall in applications for GP training. BMJ 349:g6139. (2013) Now or never: shaping pharmacy for the future. The report of the commission on future models of care delivered through pharmacy (Royal Pharmaceutical Society, London). (2015) A cohort study of influences, health outcomes and costs of patients’ health-seeking behaviour for minor ailments from primary and emergency care settings. BMJ Open 5:e006261. (2015) Building the workforce — the new deal for general practice. (Royal College of General Practitioners, British Medical Association, NHS England and Health Education England, London). (1986) The Nuffield report: a signpost for pharmacy. BMJ 292(6527):1031–1033. (2011) The evolving role and nature of general practice in England (King’s Fund, London) http://www.kingsfund.org.uk/sites/files/kf/field/field_related_document/gp-inquiry-report-evolving-role-nature-2mar11.pdf (accessed 26 May 2017). (2017) GP Forward View interim assessment, http://www.rcgp.org.uk/policy/general-practice-forward-view.aspx (accessed 26 May 2017). (2014) Pharmacist consultations in general practice clinics: the Pharmacists in Practice Study (PIPS). Res Social Adm Pharm 10(4):623–632. (2004) Impact of nurse practitioners on workload of general practitioners: randomised controlled trial. BMJ 328:927. (1967) The discovery of grounded theory: strategies for qualitative research (Aldine, Chicago). (1994) Beginning qualitative research: a philosophic and practical guide, Qualitative data analysis: using the constant comparative method. (Falmer Press, London), pp 116–137. (2013) Qualitative methods for health research (Sage, London), 3rd edn. (2008) Basics of qualitative research: techniques and procedures for developing grounded theory (Sage, Thousand Oaks, CA), 3rd edn. (1997) Sampling in qualitative research. Purposeful and theoretical sampling; merging or clear boundaries? J Adv Nurs 26(3):623–630. (2001) Validity in qualitative research. Qual Health Res 11(4):522–537. (2013) On ‘reflexivity’ in qualitative research: two readings, and a third. Qualitative Inquiry 7(1):35–68. (2014) Integrating pharmacists into primary care teams: barriers and facilitators. Int J Pharm Pract 22(4):292–299. (2013) Stakeholder experiences with general practice pharmacist services: a qualitative study. BMJ Open 3(9):e003214. (2009) Pharmacist’s identity development within multidisciplinary primary health care teams in Ontario: qualitative results from the IMPACT project. Res Social Adm Pharm 5(4):319–326. (2017) Declaration of competence. https://www.cppe.ac.uk/services/declaration-of-competence (accessed 26 May 2017). (2012) Pharmacist provision of primary health care: a modified Delphi validation of pharmacists’ competencies. BMC Fam Pract 13:27. (2000) ‘Strong medicine’: an analysis of pharmacist consultations in primary care. Fam Pract 17(6):480–483. (2013) Pharmacist-led management of chronic pain in primary care: results from a randomised controlled exploratory trial. BMJ Open 3:e002361. (2012) A pharmacist-led information technology intervention for medication errors (PINCER): a multicentre, cluster randomised, controlled trial and cost-effectiveness analysis. Lancet 379(9823):1310–1319. (2014) A cluster randomised controlled trial of a pharmacist-led collaborative intervention to improve statin prescribing and attainment of cholesterol targets in primary care. PLoS One 9(11):e113370.